I woke up with the start of a cold this morning. To help the cold get off to a good start, I decided to go to the Tax Day Tea Party at the Federal Building in downtown Salt Lake. 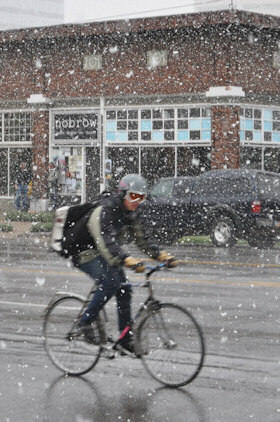 Salt Lake was suffering a wet and heavy mid April snow (global warming, you know). The inclimate weather and the fact that the rally took place in the middle of a work day kept the crowds down. Due to the snow and a lack of a good place to take picture, I only have a score of photos from the event. I have a errand to run, but will hopefully have the full set labeled before the night is through. Salt Lake had a second rally at the post office. I was worried about my cold and water logged camera; so I skipped the second rally. And you consider yourself a patriot? Had Washington been as easily disuaded by a few snow flakes crossing the Deleware, we'd still be paying the English tea tax. What makes you think I consider myself a patriot? I think most of the people who went to these events did so because they believe in limited government. Some might consider themselves patriots. I think the protests reflected a gamut of opinions. Of course, I read your post and see nothing but a small-minded progressive driven by images and petty prejudices. BTW, the last "protest" I went to was an antiwar thing just before the bipartisan vote to invade Iraq. I ended up wandering away in disgust after encountering some code pinkers. I was against both the Bush invasion of Iraq and Obama's rescue because I feel that both actions were poorly thought through. Both policies were driven by technocrats who thought that they could progress society through massive government intervention.